Lock in a great price for Hotel Fonte do Fraile – rated 9.4 by recent guests! The property was very clean and rooms were very big. Staff were extremely friendly and helpful. Would certainly recommend. Nice and helpful people. Excellent room and spa was a plus. The hotel is stylishly and beautifully furnished. The location is excellent for the beach and town. The way they do breakfast, without a buffet, works well in a slightly surprising way. The staff were kind. Quiet, relaxing public spaces. Classy hotel. Very nicely decorated and laid out. Lovely, large double bed with quality linen.Large underground garage. The location is great. Close to the sea, 10 minutes walk to the bars on the promenade. Centrally located right in the route of the Camino dos Faros. Staff is friendly and helpful. The rooms are very nicely furnished and very clean. Hotel Fonte do Fraile This rating is a reflection of how the property compares to the industry standard when it comes to price, facilities and services available. It's based on a self-evaluation by the property. Use this rating to help choose your stay! Fonte do Fraile is located 150 feet from Canido Beach in the fishing village of Malpica, on the Costa da Morte. It features 4921 ft² of gardens, and a covered terrace. 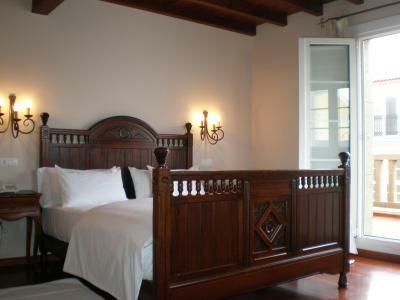 All of the rooms at Fonte do Fraile have different styles and mix wood, stone and modern materials. All come with air conditioning, a balcony, wired music and a TV. Inspired by traditional Galician architecture, the Fonte do Fraile offers a free internet terminal, as well as a café. There is also a lounge with a fireplace, and another chill-out lounge in the conservatory. Fonte do Fraile is located only 22 mi from A Coruña Airport. Santiago de Compostela is 39 mi, while Finisterre is 50 mi away. This property is also rated for the best value in Malpica! Guests are getting more for their money when compared to other properties in this city. When would you like to stay at Hotel Fonte do Fraile? This charming room features free Wi-Fi, a TV and a private balcony. The bathroom includes a hairdryer. Public parking is available on site (reservation is needed) and costs EUR 6.60 per day. This charming room features 2 double beds. It comes with free Wi-Fi, a TV and a private balcony. The bathroom includes a hairdryer. 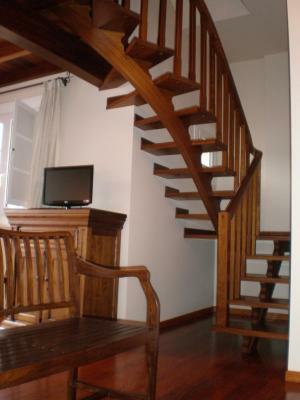 This duplex suite features 2 levels connected by a wooden staircase. Downstairs there is the bedroom, bathroom and private terrace with hammocks. Upstairs there is a lounge with sofas, a desk and satellite TV. The suite also comes with a mini-fridge and free Wi-Fi. House Rules Hotel Fonte do Fraile takes special requests – add in the next step! Hotel Fonte do Fraile accepts these cards and reserves the right to temporarily hold an amount prior to arrival. Please note, the pool and the spa are open from 17:00 to 20:00. Habitaciones amplias, confortables y limpias. Street in which it is located is steep so a bit difficult for older people with difficulties to walk, not our case. Comfortable room. Good location. Easy to park nearby. Positioned on a very steep hill but not a big issue. More than a short walk into town though promenade along beach is pleasant in good weather. For us the location was great, we could hear the sea but no traffic or whatsoever. I could imagine that someone might like a Hotel even more centrally located. Yet this is the small town of Malpica where you have to make choices instead of wanting everything at once. Because my Spanish is not brilliant it would have been a little easier if the staff had known a little English. But we got along and got all the information we needed. As we were on a hiking trip where you definitely want a breakfast and want to start the day as early as possible it would have been nice to get breakfast earlier than 8.30. It was very elegant. Good value. The hotel was extremely clean and the staff were specially nice. It is very, very close to the beach and a 10 min walk from a couple of restaurants and the port. Perfect place if you want to go with your SO. I went in winter for a scuba diving course and was extremely pleased with the place. Try to call before booking. To noisy. You could hear next door guest snoring, shawering, conversation, tv, phone, etc Walls were made of paper. Didn't sleep very well because of the noise.